Reef crabs (reef-krabz) come out to hunt at night, but will scurry to a crevice if threatened. 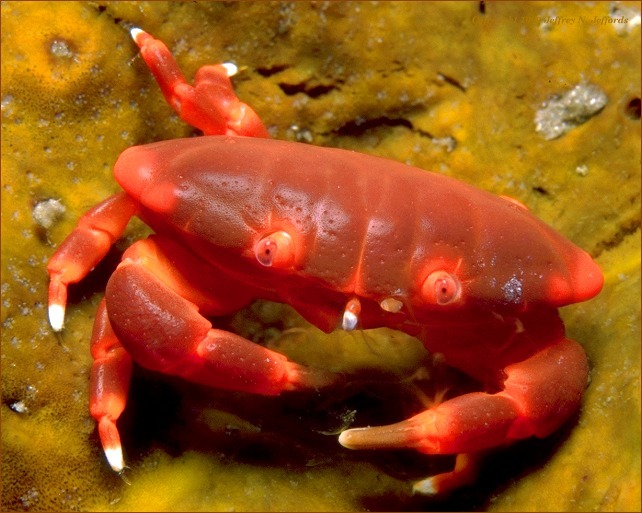 This energetic crab with bright red eyes is often seen on our Southern shores clambering among boulders at night. Also on coral rubble and under stones. Sometimes also seen on undisturbed rocky shores of our Northern shores. It is rarely seen out and about during daylight. Body reddish with large rounded pincers and bright red eyes. Walking legs with pointed tips to cling to rocks. One of its pincers is enlarged and armed with a molar-like 'tooth' to crush snail shells. The other pincer has slim 'fingers' that act like chopsticks to remove the snail after its shell is crushed. It is fast moving and can be aggressive if it is cornered. The Reef Crab is found at low tide and below on rocky ocean shores, usually under loose rocks and boulders. The conspicuous coloring of the spotted reef or coral crab is highly distinctive. Its smooth, light brown carapace has two large red spots behind each eye, three across the middle, and either two or four at the rear. Between the eyes the carapace has four small, rounded projections, which are also characteristic of the species. It is a nocturnal, slow-moving crab that uses its disproportionately large claws to feed on corals, snails, and other small marine creatures.